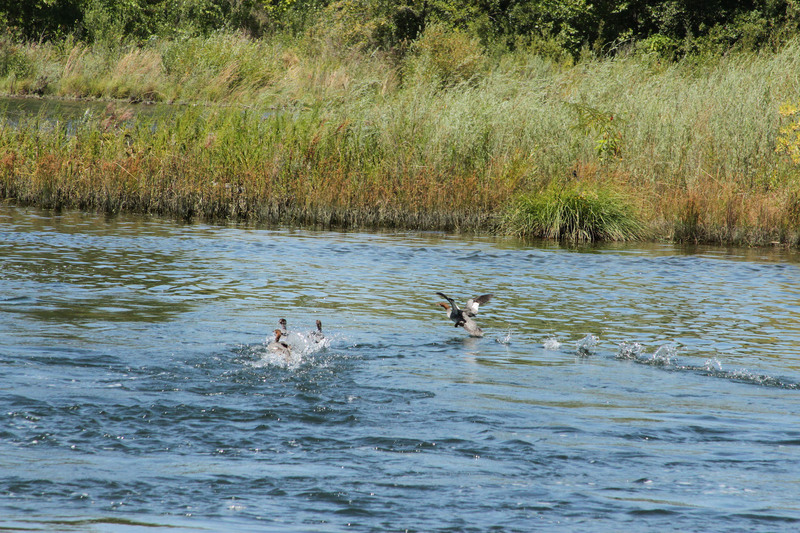 Help Birds Soar Farther in 2016! Just a quick reminder that it’s the final day of 2015 and you can still give the gift of flight with a tax-deductible donation. 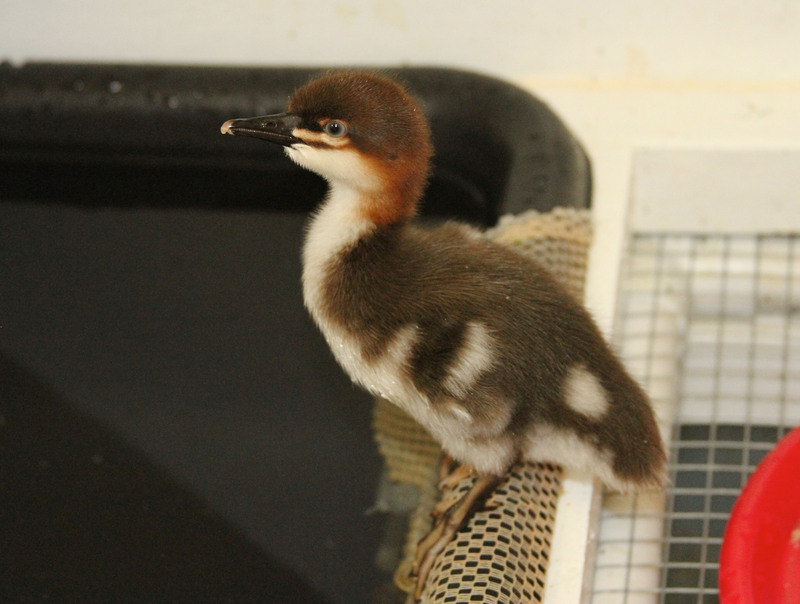 As a bird lover we depend on your generous gifts to keep our clinic doors open 365 days of the year to make sure the 5,000+ avian patients get the best possible care. If you’ve already donated, thank you again for your support! 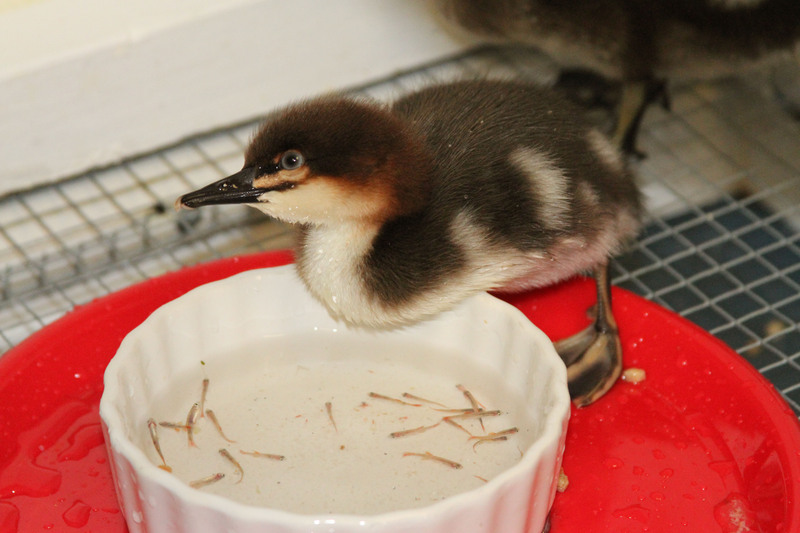 If you haven’t yet, please join us and make a contribution to Bird Rescue. With warm wishes for a wonderful New Year! Maybe it’s snowing where you are, but we never get a snowy day around our centers. We do get our share of Snowy Egrets: 308 this year! This year, we are counting our blessings. 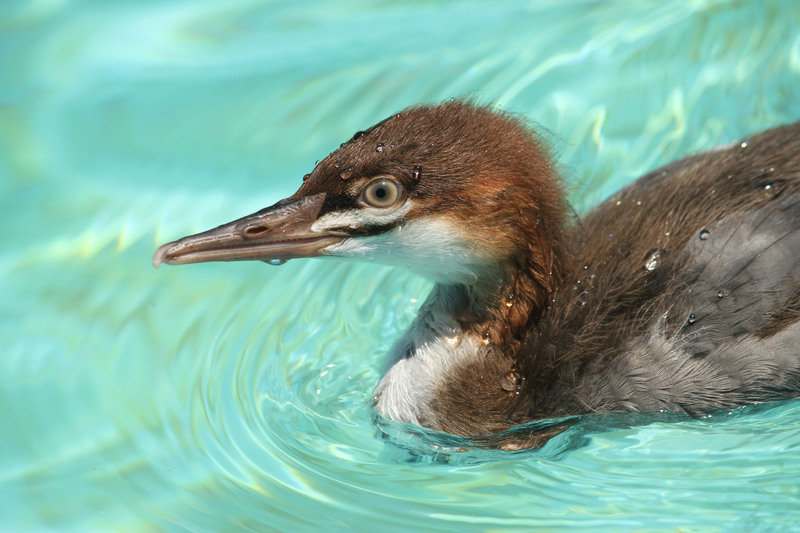 With thousands of birds in need of care – your generous support in 2015 has made all the difference in our ability to give these wild birds a second chance at life. 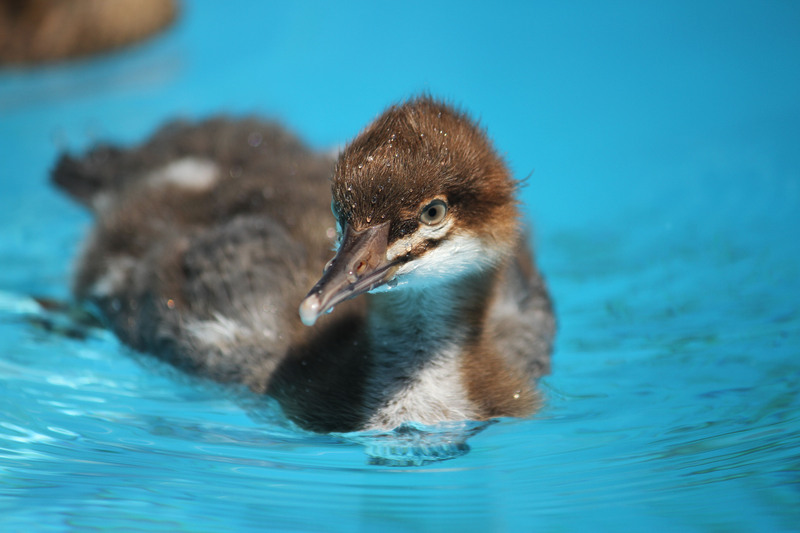 From the rescue of baby Snowy Egrets (shown) at the 9th Street Rookery in Santa Rosa… to the response to our work with pelicans, gulls, and cormorants on the Santa Barbara oil spill in May… to the volunteers who worked tirelessly helping Surf Scoters slimed by Mystery Goo in San Francisco Bay – your help has carried us through a very busy year and is so appreciated. As the holiday season enters this week of the festival of lights and you spend more time with family and friends, we want to remind you that as a bird ally you are in our thoughts. 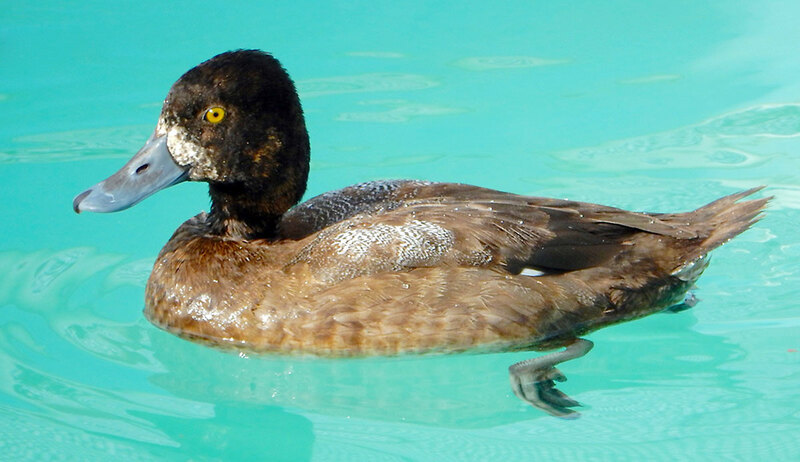 A female Lesser Scaup is our patient of the week. 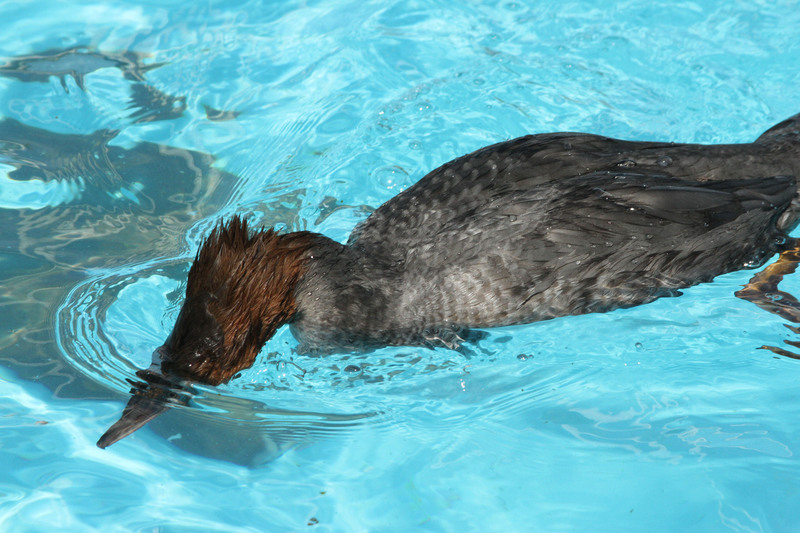 This scaup was brought to our Los Angeles Center by a concerned member of the public. The downed bird was found on the streets of Long Beach and the rescuer thought she looked like she was going to be attacked by crows. 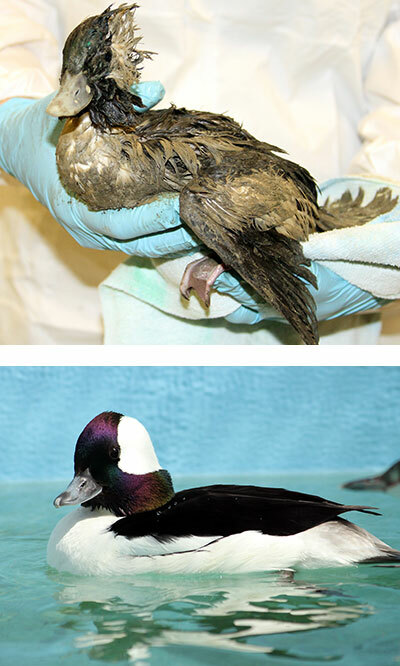 Upon intake the Bird Rescue staff the noticed that the scaup appeared to be contaminated with an unknown oil-based substance. 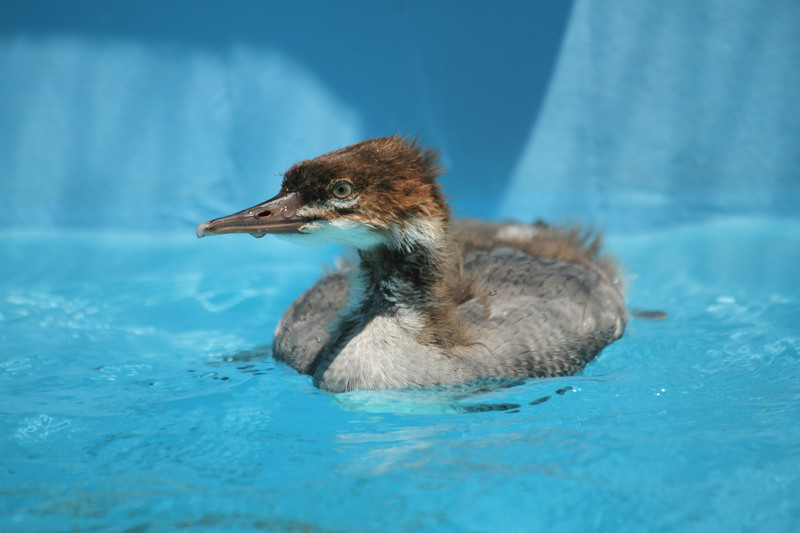 She was washed clean and is currently living in one of the rehabilitation pools. 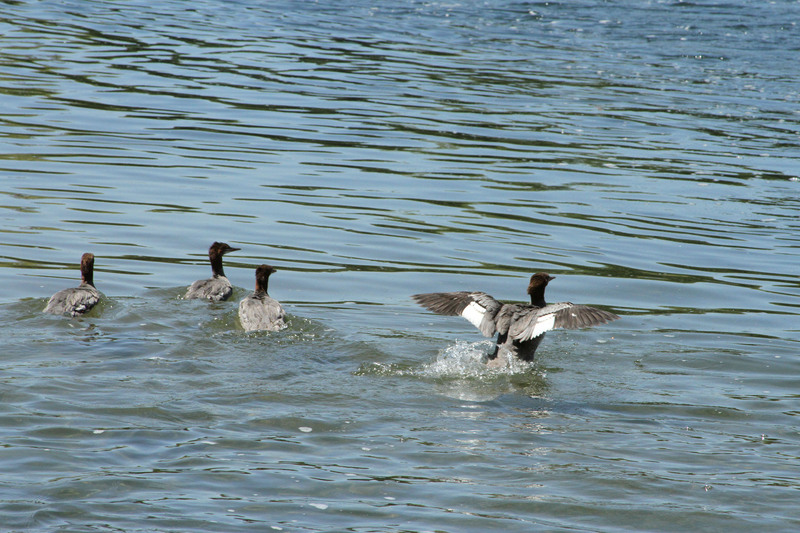 Lesser Scaups are some of the most numerous and abundant diving ducks in North America – especially in inland waters of the western United States. 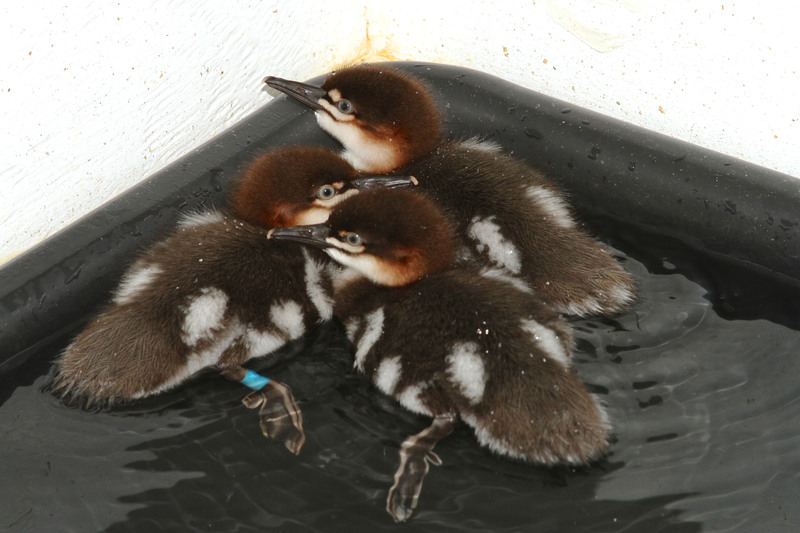 In winter they are often seen on lakes and bays in dense flocks, numbering in the thousands. They are very similar to the larger Greater Scaup. Our patient of the week is a beautiful Red-breasted Merganser in care at our Los Angeles center! 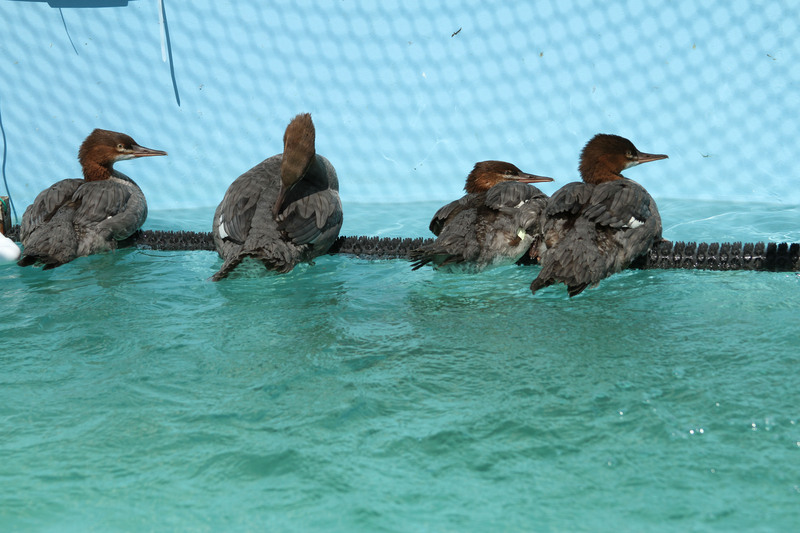 Winter migrants, like this merganser, are flying south for warmer weather and that means we are seeing more of these migrants in care. 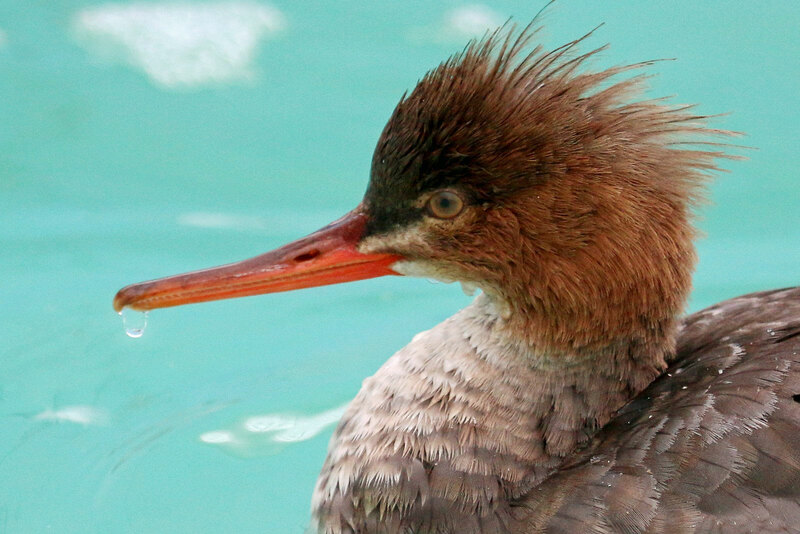 Mergansers are large diving ducks with long, thin bills that are lined with serrated edges to help them capture fish. 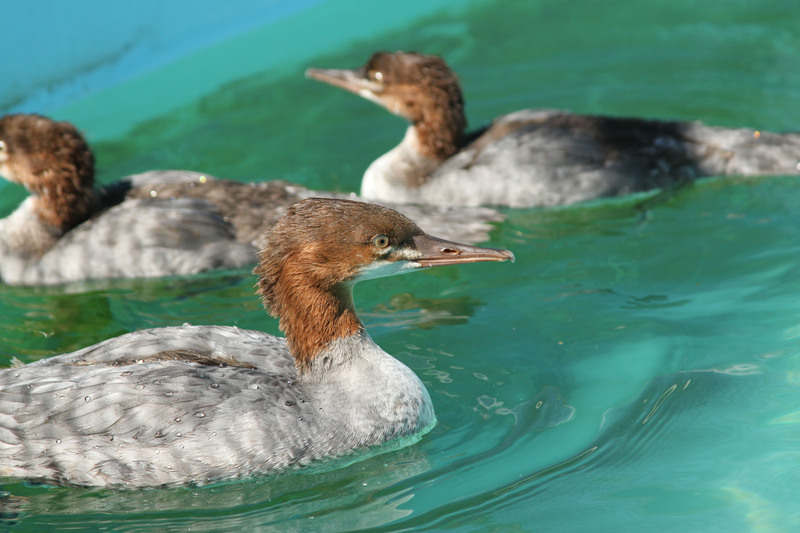 Both male and female Red-breasted Mergansers have a distinctive double crest of plumes at the back of their heads. 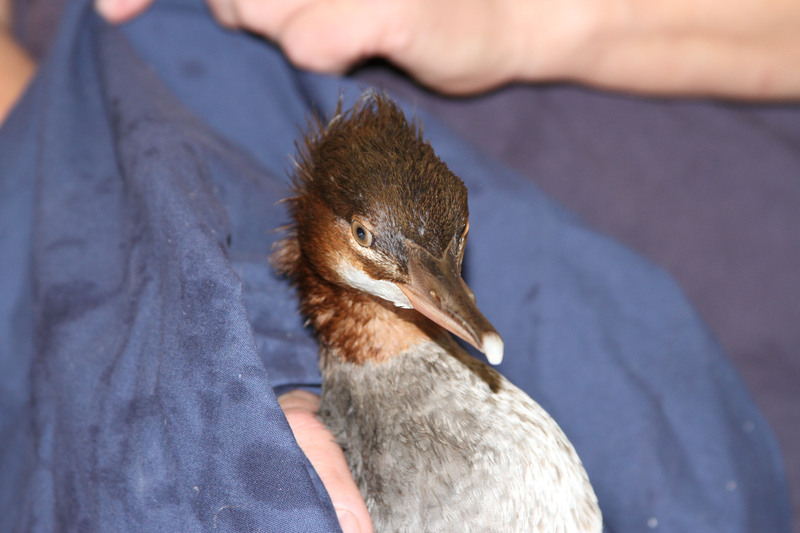 This bird was rescued earlier this week by Santa Monica Animal Control. It could not fly, was weak and emaciated. In a few days it will be ready for release. To answer the question of how I helped a bird today, I must first back up to a recent Saturday when I was volunteering in the San Francisco Bay clinic. 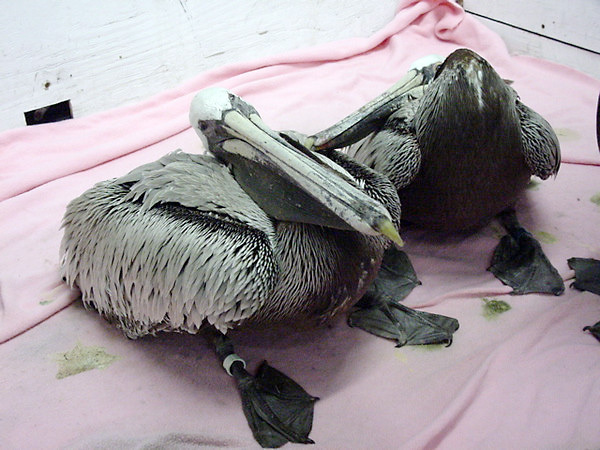 Two adult Brown Pelicans had come into care with Domoic Acid poisoning, which can involve seizures. In order to control the seizures, the patients are heavily sedated to keep them still and quiet, almost in a comatose state. I was asked to assist the staff with the next round of IV fluids by acting as handler. I thought nothing of that when asked, as I’ve done this many times over the years. 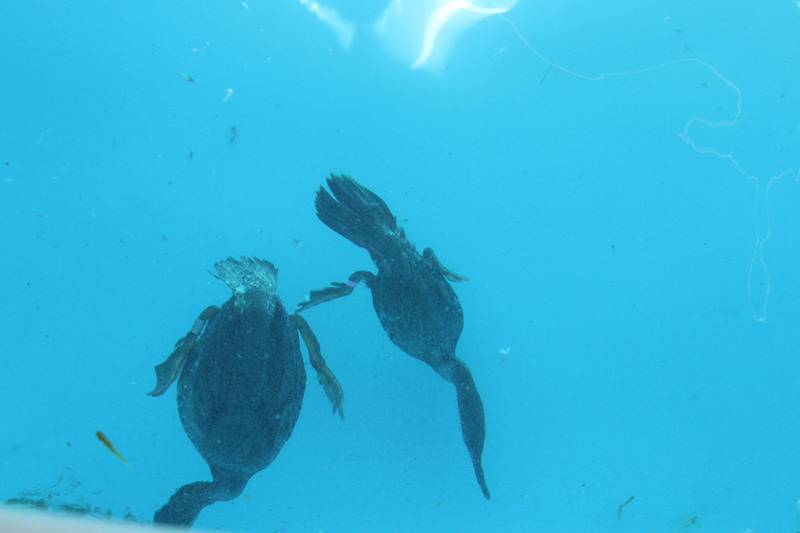 One patient was being housed in one of the soft-sided pelagic boxes, which I thought very odd because pelicans are very tall birds and are usually housed in enclosures that accommodate their size. OK, so that was a new one on me. When I pulled back the sheet covering the top of the box and got my first look at the patient, I had to stop for a few seconds and gather my composure. This magnificent, beautiful adult pelican was lying down in the box with its head propped up on towels, like a pillow. As I looked at the patient lying there, completely helpless and vulnerable, its state really touched my heart and paralyzed me for a few seconds. I picked up the bird, and it offered no resistance. The patient’s condition actually brought tears to my eyes. a rigorous treatment and can survive. How did I help a bird today? By reaching inside to find the courage and strength to keep my emotions at bay as was able to lend assistance to this poor animal in need. When I reported for my shift the following Saturday, my first question was ‘how are the pelicans doing?’ I was so happy to learn that they had recovered and were now outside in the large flight aviary getting their health and strength back. Over the years, I have come to love and respect the animals that have come through our door for help. I’ve seen birds that have come in with broken wings, fishing line and fishing hooks tangled around legs, wings, and mouth, infected wounds, birds that have been the subject of human cruelty; and somehow, they manage to live and survive in the wild with these incredible injuries that cause more pain than I can imagine. I am constantly amazed by their resolve and determination to survive. Bird Rescue treats on average 200+ Brown Pelicans a year. 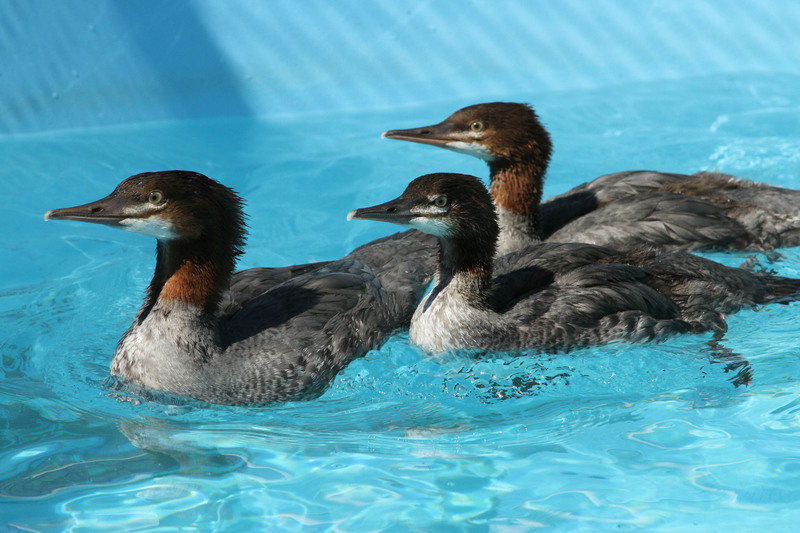 Many of these majestic birds come into our two California centers with injuries caused by humans, ranging from the unintentional fishing line entanglements to outright cruelty. 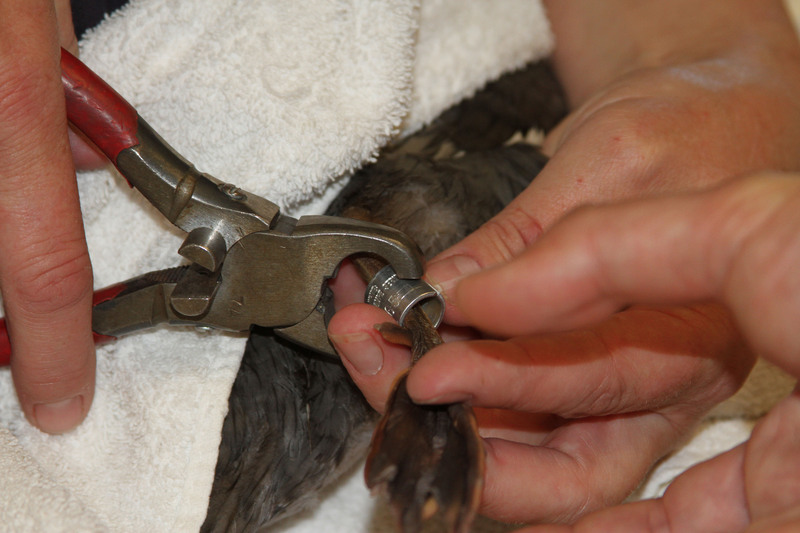 All of our pelicans are released with blue bands to help track them in the wild. 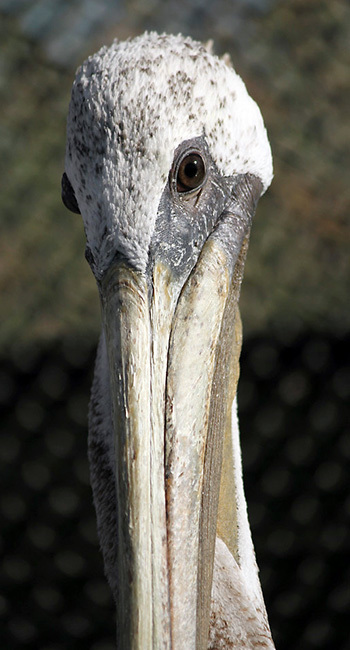 Since 2009, we have banded 1,200 pelicans and have received more than 800 sightings reported by citizen scientists. 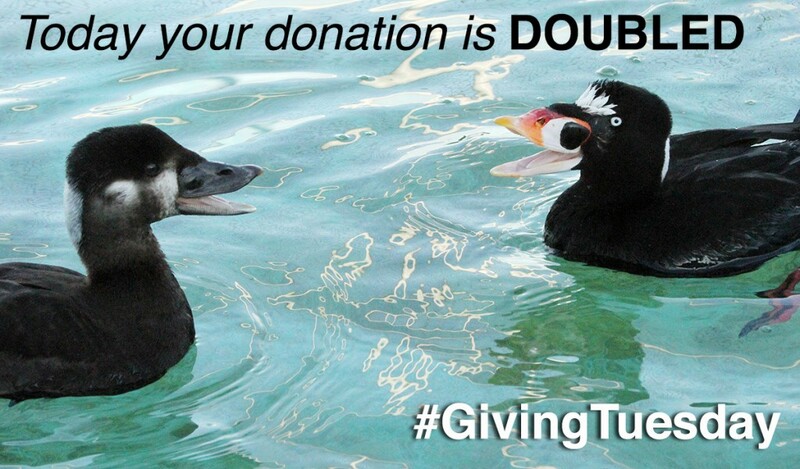 On #GivingTuesday Your Contribution Goes Twice As Far! Today is #GivingTuesday, a special day for Non-Profit Organizations everywhere – a day that celebrates giving during the holiday season. 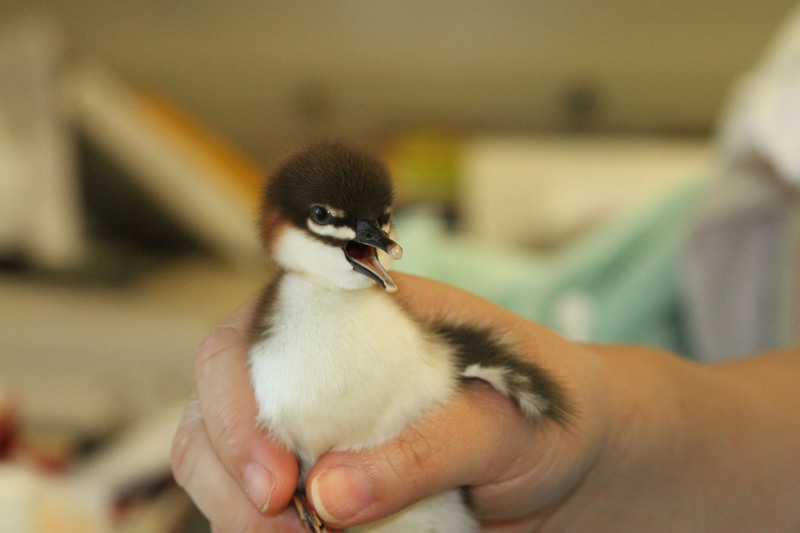 To help us celebrate, an anonymous International Bird Rescue donor will match all #GivingTuesday online contributions made today – up to $5,000! Make a donation online before midnight tonight and your gift is DOUBLED. 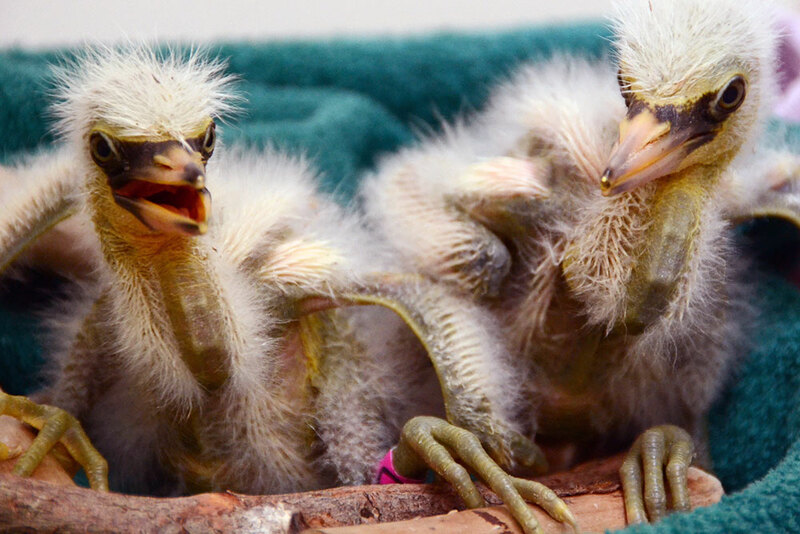 We know there are many worthy non-profit groups to support this holiday season, and we hope you’ll consider Bird Rescue when making your year-end, tax-deductible donations. Won’t you please join us to help reach our $10,000 #GivingTuesday goal today?